November 2014 – YELLOWSTONE – In the latest update of the Yellowstone volcano by the United States Geological Survey (USGS), October registered 98 total earthquakes in the Yellowstone National Park region. This seismic activity shows 21 more earthquakes than those reported in September. Although there was more activity in October, the highest magnitude was lower than the one reported in September. The volcano’s current alert level is “normal” and current aviation color code is “green.” This is clear indication that no massive eruption of the supervolcano is imminent. 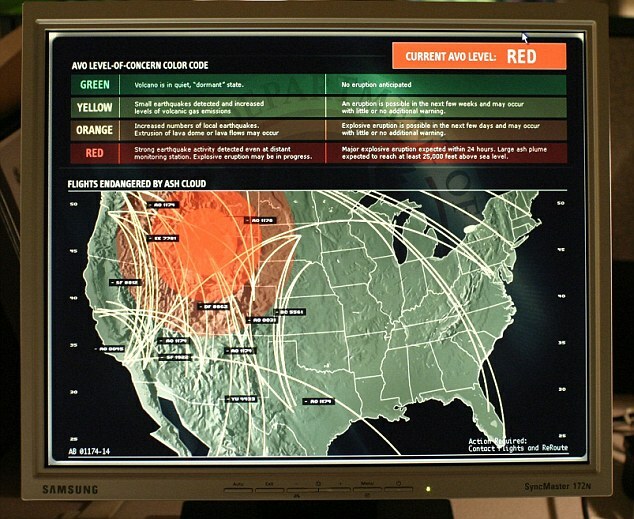 According to the USGS, their information comes from the University of Utah Seismograph Stations and is responsible for the operation and analysis of the Yellowstone Seismic Network. 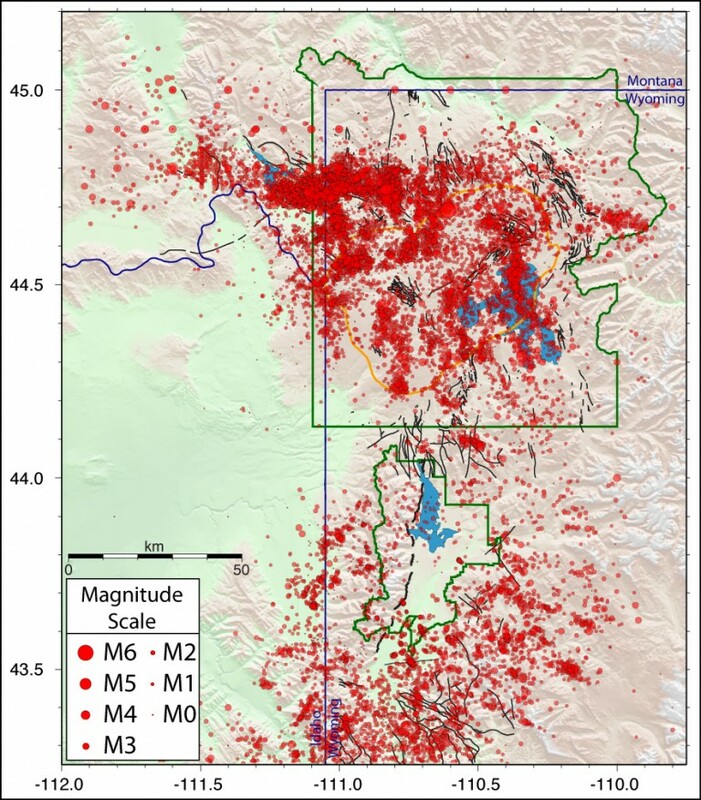 “During October 2014, the University of Utah Seismograph Stations, responsible for the operation and analysis of the Yellowstone Seismic Network, reports 98 earthquakes were located in the Yellowstone National Park (YNP) region. The largest event was a small earthquake of magnitude 2.7 on October 29, at 3:55 PM MDT, located about 17.5 km (11 miles) south-southwest of West Thumb, YNP. This earthquake is part of a small swarm of 15 earthquakes that occurred over six hours. “Yellowstone earthquake activity in October is at low background levels.” As the Inquisitr reported for September, nearly half the earthquakes were registered for the Yellowstone volcano in September than there was in August. August had 207 and 71 were reported in September. The strongest earthquake that month was September 24 when it reached a magnitude of 3.2 about 9 miles south of Mammoth. ; no earthquake swarms were reported in September. Ground deformations were updated by the USGS as well in the October report. “Ground deformation was also reported in north-central Yellowstone. The rate of subsidence is holding steady at about 5 centimeters a year. “The Yellowstone Volcano Observatory (YVO) provides long-term monitoring of volcanic and earthquake activity in the Yellowstone National Park region. Yellowstone is the site of the largest and most diverse collection of natural thermal features in the world and the first National Park. YVO is one of the five USGS Volcano Observatories that monitor volcanoes within the United States for science and public safety.” The National Park Service posted a notice on its website that Yellowstone volcano won’t erupt anytime soon despite rumors implying otherwise. “Though another caldera-forming eruption is theoretically possible, it is very unlikely to occur in the next thousand or even 10,000 years. A couple of weeks for certain it will not erupt.. that's what he said. After two weeks.. no guarantee . Let's all hope this is a media edit gone wrong. Most of my viewers/readers know where I stand on Yellowstone. I personally think we're at more risk of earthquake activity than eruption threats. He asks, what do you mean by NOT happening in the "foreseeable future"? The response from the geologist was quote "a couple of weeks" (2 weeks). 2 weeks until no eruption? Or knowing the future for certain? 2 weeks until nothing is going to happen? 2 weeks of what? Silence? Couple weeks until a blast? What do they mean? It's very confusing. Does the geologist mean that he knows for certain there will not be an eruption for the next 2 weeks? That statement would make no sense (as no one can know the future for certain). Reporter at the end rather cryptically , saying there are now 2 camps of people ... "those who believe the volcano will never erupt".... and "those who believe it will erupt tomorrow". Very strange choice... never or tomorrow? This just was posted late last night, shows as being uploaded January 29, 2015 at 1050pm - from Sioux Falls South Dakota ABC News, talking about potential ash fall over the state from the Yellowstone eruption. Let's hope this is wrong, otherwise we need to prepare now. Follow the motto, Don't be scared, be prepared. If nothing happens, then we'll be all good. But as I think you're smart enough to be prepared, you'll move in time, when that part of the planet begins to move. I think in Dutchsinse's video he was blowing it out of proportion. The geologist was asked about the "foreseeable future" and obviously his "foreseeable future" only entails two weeks where he feels it will not erupt...however he can't guarantee anything after two weeks. He's playing it safe as most of us do by holding our cards close to our chest...he doesn't want to be dumped upon by the professional world if nothing happens. Jenetta wrote: I think in Dutchsinse's video he was blowing it out of proportion. The geologist was asked about the "foreseeable future" and obviously his "foreseeable future" only entails two weeks where he feels it will not erupt...however he can't guarantee anything after two weeks. He's playing it safe as most of us do by holding our cards close to our chest...he doesn't want to be dumped upon by the professional world if nothing happens. "COBRA – OK. The light forces are monitoring the situation in Yellowstone and are actually buffering it for quite some time. 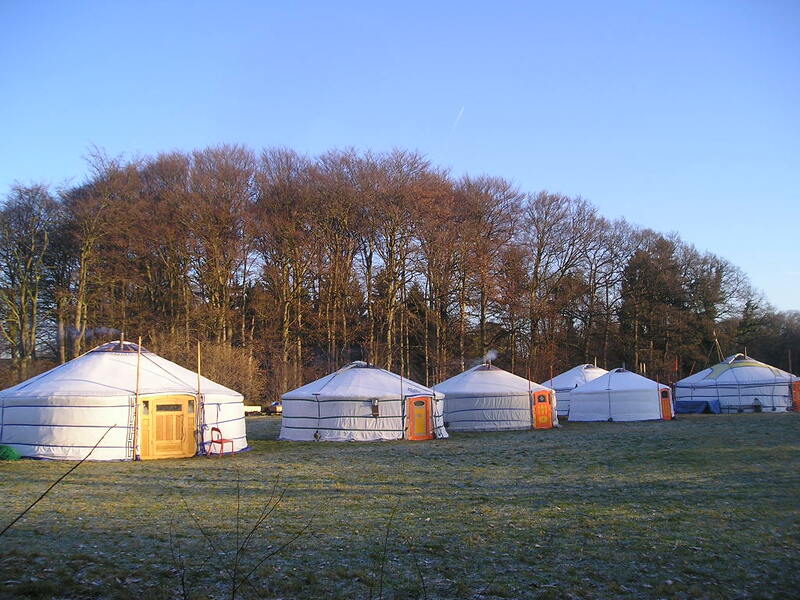 They might not be able to completely guide the situation without any earthquakes or interruptions in that area. I can not guarantee that, but most likely, they will not be very dramatic." This is consistent with other ET info that came my way a few years back. 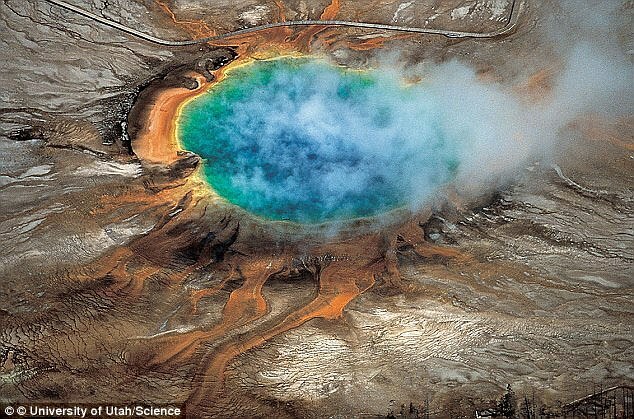 A supervolcano in the heart of America's northwest has the potential to blanket the US in a 'nuclear winter'. If it were to erupt, the Yellowstone supervolcano would be one thousand times as powerful as the 1980 Mount St Helens eruption, experts claim. While it has lain dormant for more than 70,000 years, scientists say that we can't rule out the possibility eruption this may some day take place - although they say the chances are extremely slim. The volcano at Yellowstone National Park in Wyoming and Montana sits atop a huge reserve of molten rock and last erupted 640,000 years ago. The public seismographs which monitor earthquakes in and around the Yellowstone super-volcano are presently OFFLINE, and the public is not presently able to see seismic activity there. Being able to see what is taking place in and around Yellowstone is of great interest to many people because if there is a sudden flurry of earthquake activity, it COULD — but not necessarily — signal a pending eruption. Since Yellowstone is the only “super volcano” on the North American continent, and is VERY geologically active, if an eruption were to actually take place, the western two-thirds of the United States would POTENTIALLY be hit with volcanic ash and a severe disruption of life. So why are the public seismographs from the US Geological Survey (USGS) OFFLINE (to the public) today? No one is providing any answers. Even more peculiar, the privately-funded seismographs from the University of Utah . . . are also OFFLINE (to the public) right now. No one is providing any explanation for this either. In the image below, the Green Colored line represents the border of Yellowstone National Park. The (barely visible) gold line represents the mouth of the super-volcano, known as the Caldera. The red dots in the image below show all the earthquakes that have recently taken place at the Yellowstone super-volcano. Maybe this is why the public seismographs are suddenly OFFLINE to the general public? We are not seismologists, but it looks (to us) as though something is happening at Yellowstone. We’re seeking out professionals to interpret what we’re seeing and will update this story when that info becomes available. In the meantime, as untrained laymen, the red dots in the image above tell us something “not good” seems to be taking place at Yellowstone. More and more changes are being reported and this time the report comes from one of our subscribers at Bunker Report on Facebook. An article from The Billings Gazette tells the recent story of a Cody photographer who has lived in the area all of his life. He reports changes he has never seen before. Maybe it could be called Colter’s Heck. A supervolcano is underneath the Yellowstone National Park. It was formed due to large amount of magma reserve and if it erupts the devastation is about 2,000 times bigger than that of a normal-scale volcano. The Yellowstone National Park in Idaho is the first National Park in the U.S. but studies found out that there's a humongous magma reserve underneath the park; experts confirmed the reserve formed a supervolcano underneath the park. When a supervolcano erupts, it has a devastating capacity so great that it can wipe our two thirds of the U.S. Recent signs show that the Supervolcano might erupt this year. Earlier this year, researchers performed an in-depth study on the supervolcano underneath the Yellowstone National Park. Experts earlier predicted that the next big one will happen in about 10,000 years. But recent behavior of the caldera and the environment surrounding the National Park is causing an alarm. There were unusual seismic activities around the world and they believe it can trigger an early eruption of the volcano. There were fumes; illuminating ground and boiling of rivers near the area suggesting that the massive volcano might erupt this year. According to a news report by Express UK, the newly released video of the volcano in Wyoming showing steam and ash rising in the surface creates a concern that the gigantic magma reserve underneath is about to blow. These behaviors weren't observed in the Yellowstone National Park earlier this year. In the latest video enhanced by YouTube user Kath Martin, it could be observed that steam and heavier fumes were rising from the ground. And before the video finished, there was a spark seen which looks like it came from the ground. The person who published the video said that the footage was from the Geyser Observation and Study Association. GOSA is the official observation partner of the Yellowstone National Park. The "purpose is the collection and dissemination of information about geysers and other geothermal phenomena in Yellowstone National Park ". GOSA constantly films time lapse videos of the Old Faithful Geyser in Yellowstone National Park using a webcam mounted in the area. While another report said there were odd boiling of Shoshone River near the park last March. Although there were boiling rivers open for swimming in the park, locals who witnessed the boiling of water in Shoshone said it is the first time it happened on this part. This might also suggest that the supervolcano is about to blow and a vent was opened. In the same report by Express, they stated that the super volcano's eruption is 2,000 times more devastating than a normal volcano. This can be attributed to the unusually large magma deposit underneath. No one can say for sure if it will happen this year, but the unusual behavior of the caldera and the surroundings is telling us that something is brewing. If the catastrophic eruption happens, it can wipe out two thirds of the U.S. making it uninhabitable, some even say it can greatly damage the earth displacing millions of residents. 50' feet wide by 6 football lengths long is a respectable gash. The August 27, 2016 Wyoming earthquake took place at 2:47 p.m. Mountain Daylight Time (2047 UTC). Many reports of shaking. August 27, 2016 earthquake in western Wyoming. 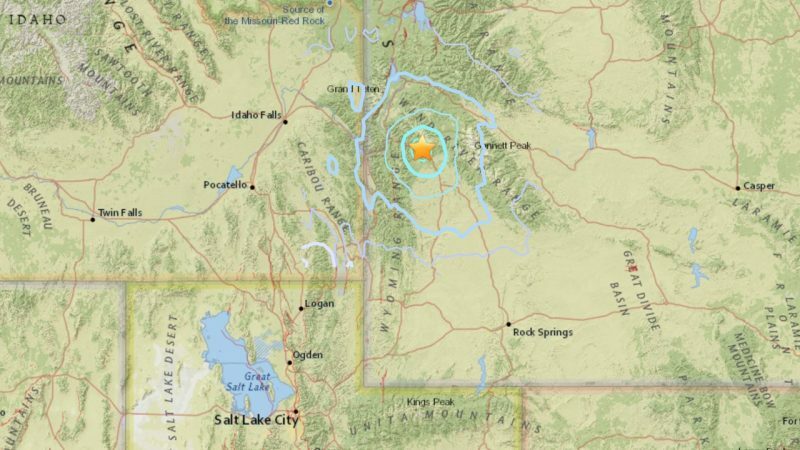 The U.S. Geological Survey (USGS) is reporting a 4.8-magnitude earthquake – an earthquake strong enough to be felt – 23 miles (38 km) east of Hoback, Wyoming. The quake took place at at 2:47 p.m. Mountain Daylight Time (2047 UTC; translate to your time zone).